Identification of the powdery mildew caused by Erysiphe trifoliorum (Wallr.) U. Braun on Melilotus officinalis. 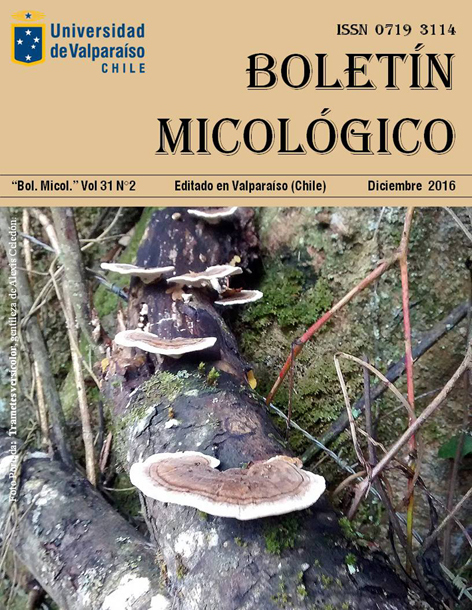 NUEVOS REGISTROS DE HONGOS GASTEROIDES LEÑOSOS DESERTÍCOLAS (AGARICACEAE): BATTARREA STEVENII (LIBOSCHITZ) FR. Y CHLAMYDOPUS MEYENIANUS (KLOTZSCH) LLOYD, EN EL NORTE DE CHILE. Mucormicosis rinosinusal por Mucor hiemalis en una paciente con Leucemia Mieloide aguda.